Country Terrace team members combined the home’s annual Thanksgiving pie social with a well-known fundraiser to support the local branch of the Alzheimer Society of Canada on Oct. 9, raising $155.25. The Komoka, Ont long-term care home decided to marry this year’s pie social with the Alzheimer Society’s Coffee Break, an annual fundraising campaign hosted by the Alzheimer Society of Canada to help support people living with Alzheimer’s disease in communities nationwide and to raise awareness of the condition. 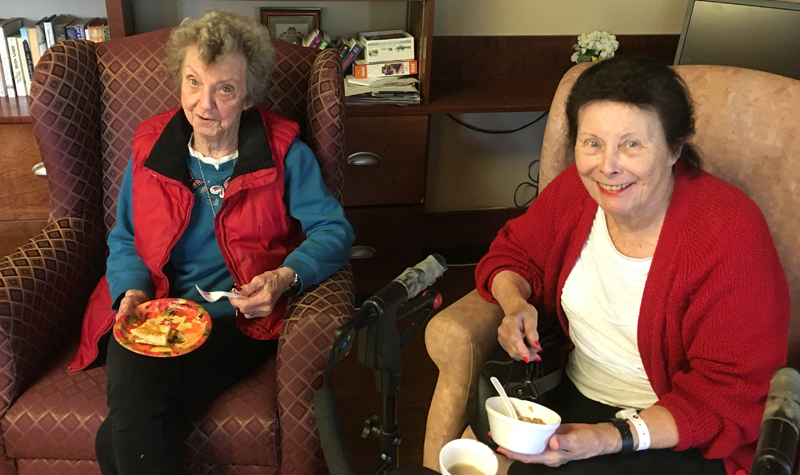 During the event, residents, family and friends could buy a piece of pie, which was brought in fresh from a local bakery, or a bowl of fresh apple crisp that was made in-house by Sharon in the nutritional care department. “All donation raised during this event when back to the Alzheimer Society,” Country Terrace life enrichment co-ordinator Christie Patterson tells The OMNIway. Coffee Break functions are hosted by workplaces and other venues, traditionally in September, which is World Alzheimer’s Month. The events feature coffee, tea, juice and baked goods sold in exchange for a donation to the local Alzheimer Society in the community where the event is held. Given the large percentage of long-term-care home residents who are affected by Alzheimer’s disease and related dementia, OMNI Health Care and its 18 long-term care homes have a history of supporting fundraising and awareness campaigns to help the Alzheimer Society and its branches. If you have feedback on this story, please contact the newsroom at deron(at)axiomnews.com.